Katrina vanden Heuvel just wrote the piece “Congress’s War Powers Must Be Made a Reality” in the Washington Post. She writes: “What does it take to get Congress to act on vital questions of war and peace? The catastrophe in Yemen may test whether Congress is finally prepared to exercise its constitutional responsibility. 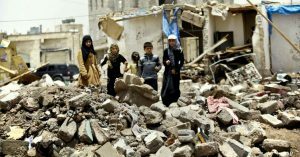 Four legislators — two House Democrats and two Republicans — have introduced a resolution under the War Powers Act demanding a vote in 15 days to end U.S. involvement in Saudi Arabia’s devastation of Yemen. Al-Adeimi is a doctoral candidate and instructor at Harvard University. She just wrote the piece “Only Americans Can Stop America’s War on Yemen,” which states: “Yemen continues to suffer in silence as the world turns away from its ongoing misery. Despite two and a half years of brutal war, the average American remains oblivious to the inconvenient truth that the United States has been helping Saudi Arabia and the United Arab Emirates destroy a sovereign country that posed a threat to no one. While rich Arab states bombard the Middle East’s poorest country, creating the world’s largest humanitarian crisis and an unprecedented cholera outbreak, our government (starting with the Obama administration and continuing with Trump’s) has continued to support them not only through the sale of weapons, but also through mid-air refueling, targeting intelligence, and other logistical support.